Invisible Children’s #Kony2012 campaign has set off a massive firestorm of criticism with the debate likely to continue raging for many more weeks and months. In the meantime, our colleagues at Al-Jazeera have repurposed our previous #SomaliaSpeaks project to amplify Ugandan voices responding to the Kony campaign: #UgandaSpeaks. 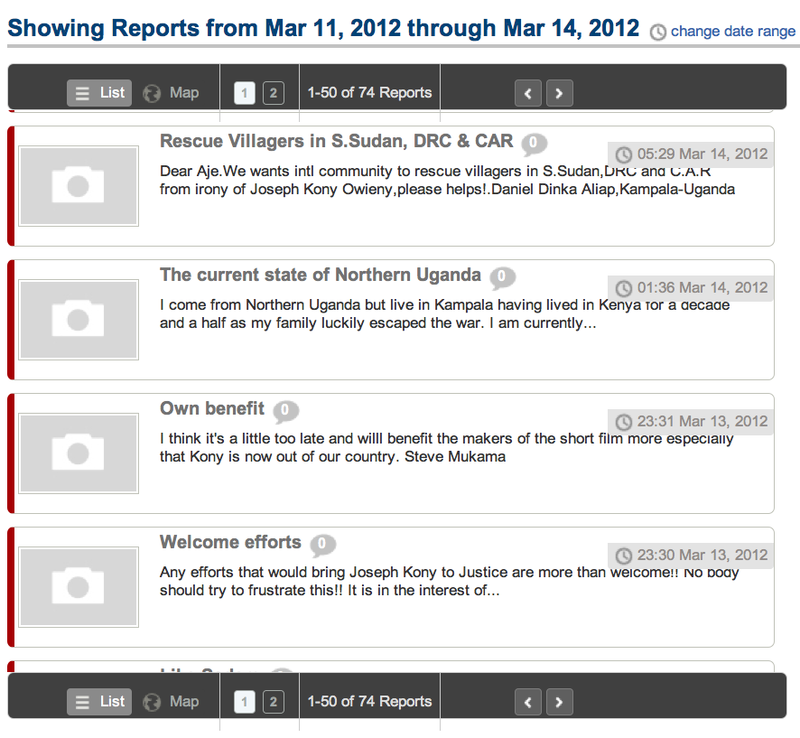 Other than GlobalVoices, this Al-Jazeera initiative is one of the very few seeking to amplify local reactions to the Kony campaign. Over 70 local voices have been shared and mapped on Al-Jazeera’s Ushahidi platform in the first few hours since the launch. The majority of reactions submitted thus far are critical of the campaign but a few are positive. The Ushahidi platform was first launched in neighboring Kenya to give ordinary Kenyans a voice during the post election-violence in 2007/2008. Indeed, “ushahidi” means witness or testimony in Swahili. 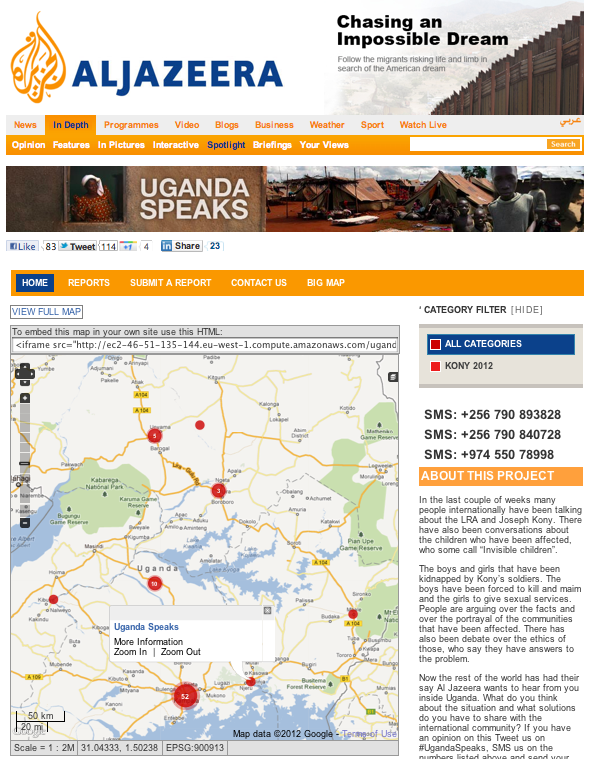 So I am pleased to see this free and open source platform from Africa being used to amplify voices next door in Uganda, voices that are not represented in the #Kony2012 campaign. Some Ugandan activists are asking why they should respond to “some American video release about something that happened 20 years ago by someone who is not in my country?” Indeed, why should anyone? If the #Kony2012 campaign and underlying message doesn’t bother Ugandans and doesn’t paint the country in a bad light, then there’s no need to respond. If the campaign doesn’t divert attention from current issues that are more pressing to Ugandans and does not adversely effect tourism, then again, why should anyone respond? This is, after all a personal choice, no one is forced to have their voices heard. I believe one way to have those local voices heard is to have them echoed using innovative software “Made in Africa” like Ushahidi and then amplified by a non-Western but international news company like Al-Jazeera. Looking at my Twitter stream this morning, it appears that I’m not the only one. The microphone is yours. Over to you.